Feed your eyes with spectacular views and your ears with serene sounds of nature with an al fresco meal that you will never forget. Before you head out for a picnic, pick up some seasonal goodies at a tailgate market or the WNC Farmer’s Market (open every day). 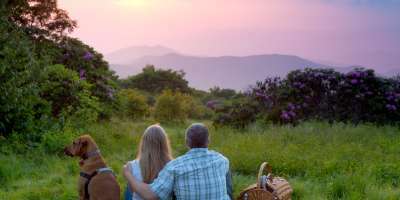 Also, many local B&Bs and hotels will help you with a picnic to go. 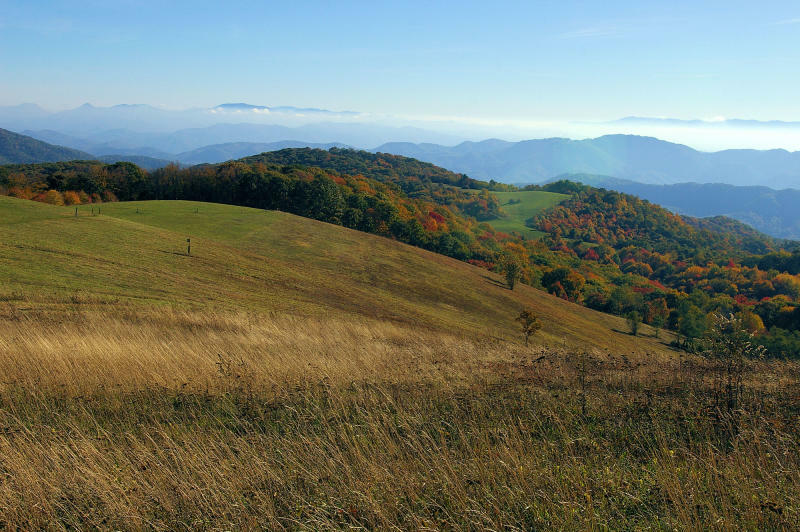 You’ll want to twirl and sing “The Hills are Alive” as you cross the grassy summit of Max Patch in Pisgah National Forest with sweeping views all around. It’s a short hike from the parking area. 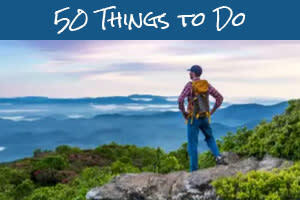 It’s located about 53 miles from Asheville via a scenic drive through Hot Springs (stop for a soak!). 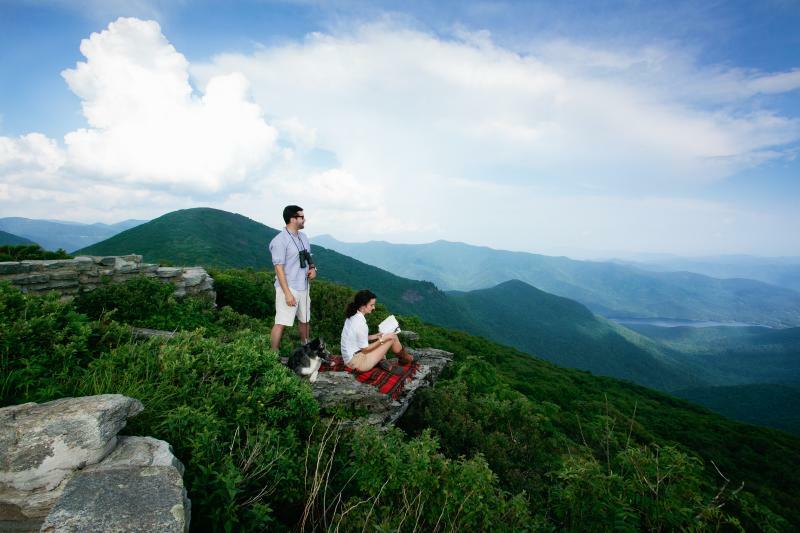 Take a short hike to the top of Craggy Pinnacle along the Blue Ridge Parkway for mountain views all around, only about 20 miles from downtown. If you are an early riser, take breakfast and watch the sunrise. Nearby is also a picnic area with no hike required! While there’s a picnic area near the top of Mt. 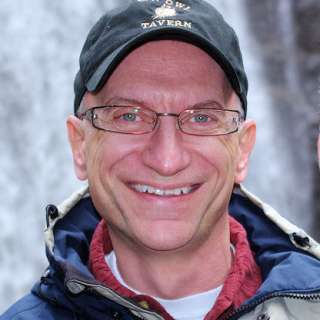 Mitchell that is convenient to the car, take a small picnic to the Observation deck at the very top of the highest peak east of the Mississippi River. Pick up goodies at their restaurant or the summit concession stand. It’s a super scenic 34-mile drive from downtown. 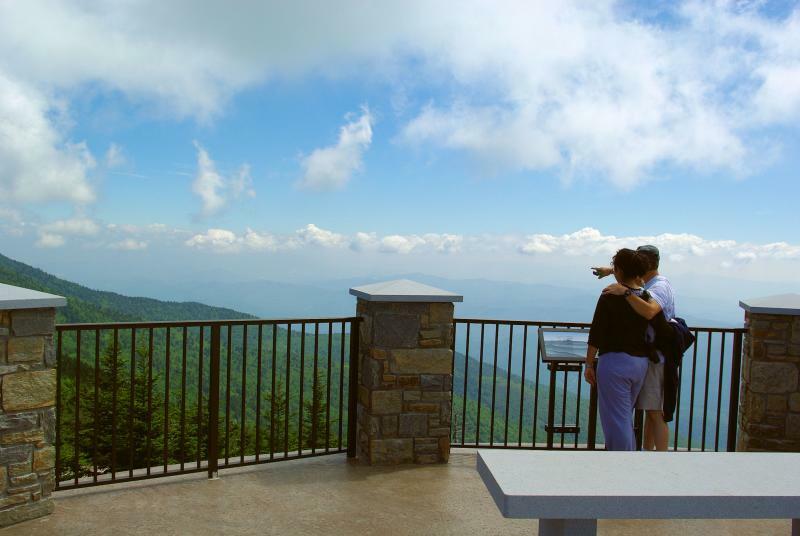 While there are countless picnic spots along the Blue Ridge Parkway, why not go to the highest point at Richland Balsam at 6,047 feet? Located at Milepost 431.4 about 45 miles from town, there are two overlooks with sweeping views and a fragrant hike through a Spruce Fir forest. 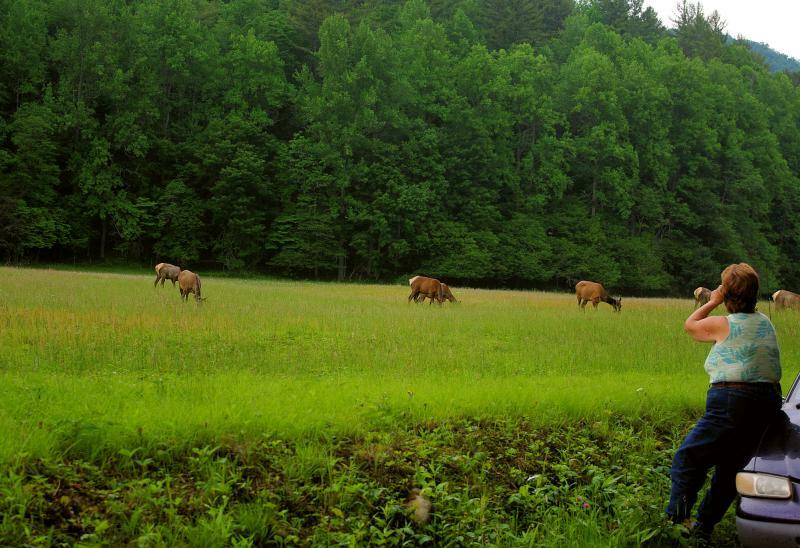 Take a dinner picnic to Cataloochee Valley in the Great Smoky Mountains and tailgate as you watch the majestic elk graze in the meadows just before sunset. But don’t share your picnic with them! Located about 45 miles from downtown. 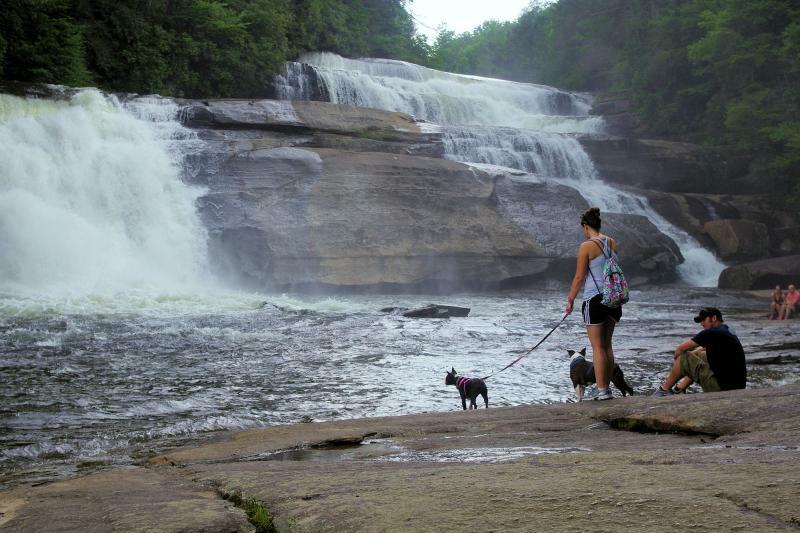 Picnic in the middle of Triple Falls in DuPont State Forest, about 40 miles from Asheville. Take the stairs to a large smooth rock area between the second and third cascade. It’s ok to bring the dogs for this one. 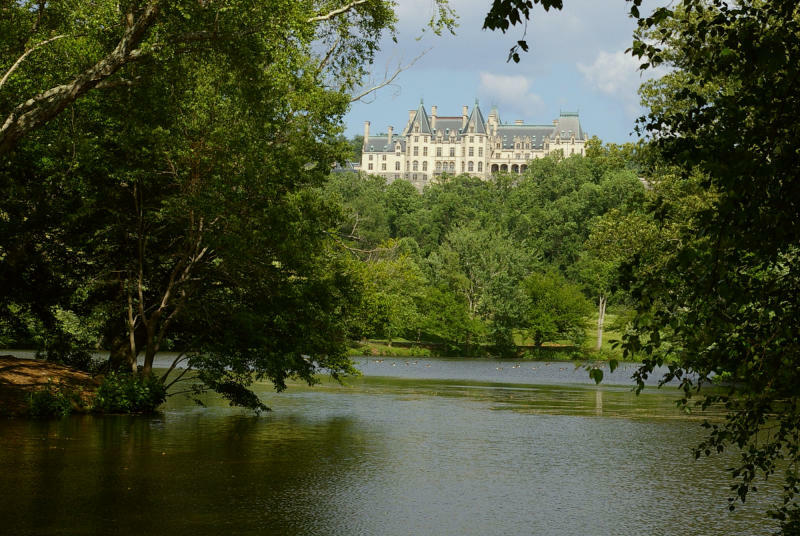 There are many great picnic spots at Biltmore. 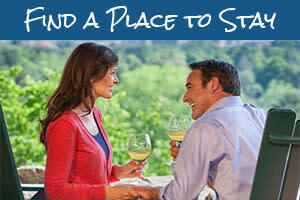 The one with the most enchanting view is by the Lagoon with the French Broad River just behind you. Grab a bottle of Biltmore wine at the Carriage House shop and picnic goodies at the Bake Shop, both located by the house. What a place to feel like royalty for the day! 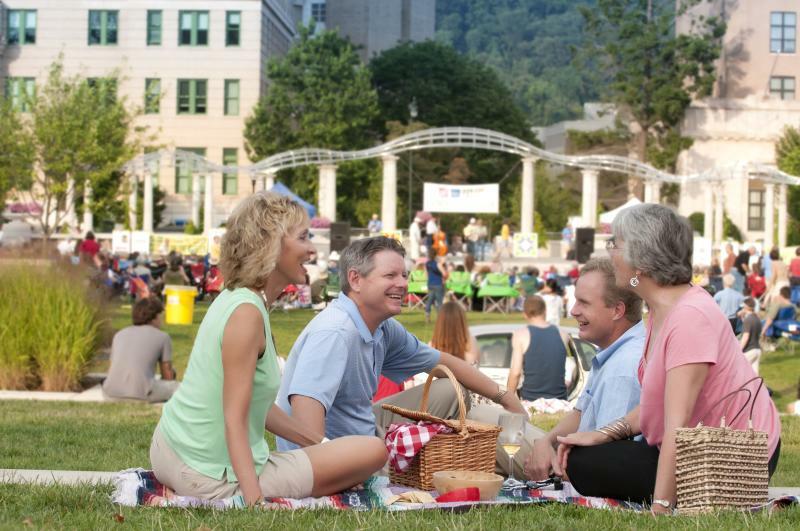 A picnic in Pack Square Park, Asheville’s longtime public square, is especially fun during a festival like Shindig on the Green. You can pick up goodies to go at one of the nearby restaurants or festival vendors and food trucks. 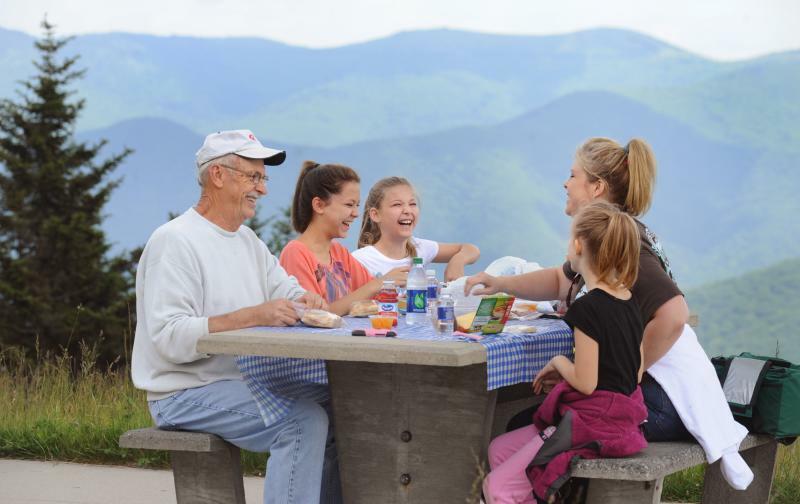 Max Patch, Mount Mitchell, Triple Falls, Cataloochee and Biltmore photos by Mark File.